The other day my mom and I went to Armando’s for lunch. Lately Isabella’s been in this “pasta” mood where she has to feed herself, and usually she only wants spaghetti. Sometimes she’ll eat penne depending on how hungry she is. I should know better then to get tomato sauce for her. Well at least she enjoyed it! This entry was posted in Isabella and tagged dirty, Pasta, sauce. Bookmark the permalink. 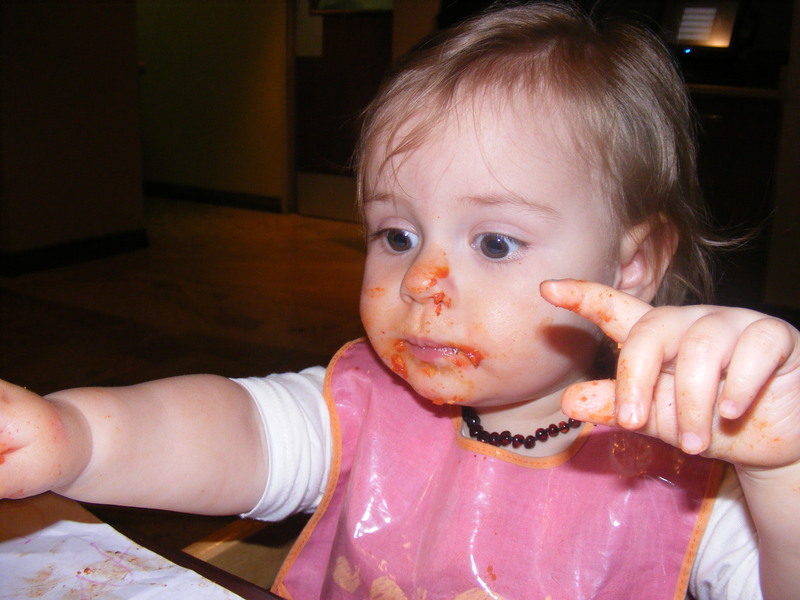 There must be something about tomato sauce that kids like – both my girls love spaghetti, and I have pictures of them when they were younger after eating something with tomato sauce where they ended up looking like oompa loompa’s! LOL!! It’s great isn’t it? We had the leftovers the next day and she ended up looking exactly the same . One of these day I’ll strip her naked and just let her loose!